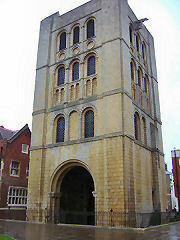 Bury St Edmunds is a picturesque market town steeped in history. Starting in the Ram Meadow car park, the following walk takes you on a circular route past the town's main sights and shops, with a few curios thrown in for good measure. 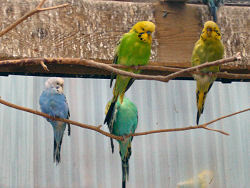 At a leisurely pace it should take approximately 2 hours to complete. Bury St Edmunds car parks charge every day of the week, but are cheaper on Sundays. There are public toilets at the car park. A market takes over the centre of town every Wednesday and Saturday throughout the year. From the car park, face the cathedral tower in the distance, and head through the courtyard of the Fox pub and out on to Mustow Street. 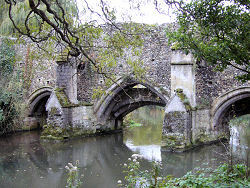 Cross the road and turn right to find Abbot's Bridge, which dates back to the 12th century, and originally linked Eastgate Street with the Abbey's vineyard on the opposite bank of the river Lark. Beside this, you can still see the Keeper's cell, from which he would have operated the portcullis which protected the Abbey from unwanted visitors. A little further along Mustow Street, enter the Abbey gardens on your left. The information board in front of you includes the current opening hours of the Abbey grounds, which vary with the changing seasons. Head straight up the path, and fork right at the first opportunity, you will find the aviary, and beyond this duck under the archway to enter the sensory garden. This small space encompasses a fountain, surrounded by highly scented herbs and plants, and tactile maps, designed specifically for the blind. 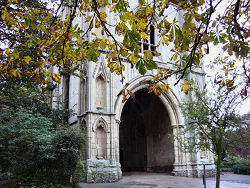 Come out of the sensory gardens towards the Abbey Gate (at which point you may wish to visit the award-winning toilets which you pass on your right). 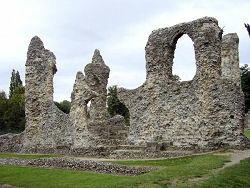 In 1327 the Abbey was stormed by the townspeople, who destroyed the original Abbey Gate and much of the monastry. Some 20 years later, work began on the replacement Abbey Gate which is the one standing before you today. Head further down the same path towards the fountain, passing by the herb garden and Refectory cafe on your right. 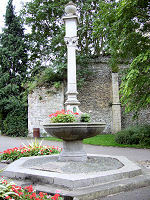 With its carved pillar and metal sundial, this fountain was a gift from the Marquis of Bristol, unveiled in 1871, and was originally installed outside the Nutshell pub in the Traverse. 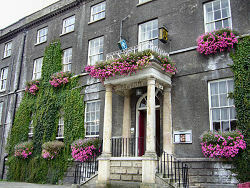 However, it was soon impeding wider vehicles, and was moved to the Abbey grounds in 1939 where it now serves as a decorative planter. Continue past the bowling green and turn left immediately after, onto the path which takes you to the ruined buildings of the original monastery. On the tallest pillar, you will find two plaques commemorating the spot where, in 1214, the barons of England swore to compel King John to sign the document now known as the Magna Carta. Rejoin the path, which now takes you into the Rose Garden, a permanent memorial to the American Servicemen who fought in World War Two, many of whom were stationed in airfields around Suffolk. Exit at the opposite corner and turn left to emerge into the Cathedral close. To your left here is a small row of residential homes built into the original abbey walls. Turn right and follow the pathway to circle around the statue of St Edmund, passing the Cathedral and the Norman Tower, known as "the great gate of the church of St Edmund", and which historically has served as the bell tower to the Cathedral. A little further on you reach the Martyr's Memorial. This was erected using public subscriptions, to remember 17 protestant martyrs who were killed for their beliefs during the reign of Mary I, known as 'Bloody Mary, who wanted to return England to Roman Catholicism. Here, take the middle path to the Charnel House, which was built in the 13th century in order to store bones previously buried in the Great Churchyard, and whose plaques make for interesting reading. St Mary's church lies to your right, completed in 1427, one of the largest parish churches in England. Mary Tudor, Queen of France and sister of Henry VIII, is buried within. At the end of the path, you reach the road opposite the Manor House, previously a clock, costume and fine art museum, but now in private hands. Turn left onto Raingate Avenue, passing the Public Record Office, and take the next road on the right, Swan Lane. Opposite you, you can clearly see large pieces of the old abbey embedded within the wall which skirts the lane. 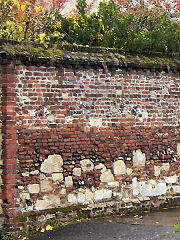 When Henry VIII dissolved the Bury St Edmund's Abbey in 1539, the towns people moved quickly to re-use the stone flints and mortar, and evidence of their recycling can still be seen throughout the town. At the end of Swan lane you come out into St Mary's Square, formerly the fashionable Horse market. To your left, notice the plaque on number 6 to Thomas Clarkson, who played a major part in the abolition of the English slave trade. His wife, Catherine, was the daughter of wealthy yarn maker, William Buck, the founder of the Green King brewery. During the 10 years that the Clarksons lived here, Dorothy Wordsworth, younger sister of poet William Wordsworth, and Samuel Taylor Coleridge were known to be visitors. Cross straight over the square and take the road to the right, Westgate Street, following the road sign towards the Theatre Royal. 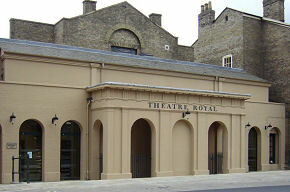 Continue straight along, passing Nuffield Hospital on your left until you reach the Green King Brewery Visitor Centre and, opposite, the Theatre Royal. 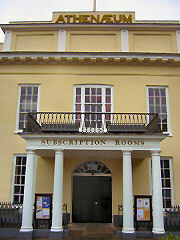 In the autumn of 2007, the theatre re-opened its doors after a major two-year project to restore it to its original 1819 Georgian configuration. 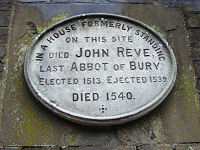 Turn right into Crown Street to pass the plaque commemorating John Reve, the last abbot of Bury St Edmunds, whose house has since made way for the Old Brewers House, a B & B establishment. Next door to this is the Dog and Partridge public house, a 17th century timber framed building whose weather vane still bears a partridge, but over the years has lost its dog. Continue further down Crown Street, passing by the entrance to St Mary's church on your right, and turn left into the narrow alleyway called Tuns Lane. The first street you come to is Bridewell lane, where you can see more evidence of the old rubble from the abbey. Turn left and cross over the road to find Church Walk, at the end of which you can see several plaques awarded by Bury in Bloom adorning the entrance to the William Barnaby yard. Cross over once again and follow College Lane all the way to its end, where you turn right along Guildhall Street. This takes you past the Guildhall which dates back to the 13th Century, when it provided a civic haven for the townspeople who were then under the strict rule of the Abbey. 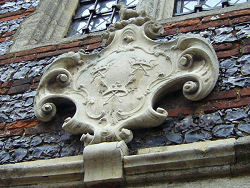 Above the doorway you can see the Borough of Bury St Edmunds coat of arms, depicting three crowns with arrows below a wolf, given to the town in 1606 when King James I granted it the first Charter of Incorporation. In 1974, a Government Act brought four local authorities together to form the District of St Edmundsbury, and the old coat of arms became redundant. It was re-instated, however, in 2006 to celebrate the four hundred years of history since its original inception. At the end of Guildhall street you will find yourself in the town centre of Bury St Edmunds, directly opposite the Corn Exchange. Historically, Bury served as the area's centre for the marketing of corn and cattle. Marking its importance, the first corn exchange was built in 1836, but the amount of trade quickly outgrew this building and so a second was built beside it in 1862. 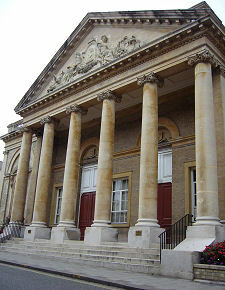 The decorative pediment at the top of the building is adorned with figures representing agriculture, and the inscription "the earth is the Lord's and the fullness thereof". 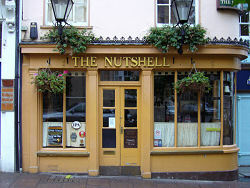 Turn right then almost immediately left to enter The Traverse, where you will see the famous Nutshell pub, reputedly the smallest public house in Britain. A few buildings along is Cupola House, with its roof-top observatory, built in 1693 by Thomas Macro, a prosperous apothecary and three times mayor of Bury St Edmunds. You can also observe a plaque to Daniel Defoe, who came to the town in 1704 after serving time in prison for the publication of his ironical pamphlet "Shortest Way with the Dissenters" in 1702, which was judged to be critical of the Anglican Church. Opposite Cupola House you will find the original Corn Exchange building, and beyond this the Market Cross building with its four decorative sculpted panels representing music and drama. You have now reached the Bury St Edmunds town centre square, The Cornhill, which hosts a market every Wednesday and Saturday throughout the year. 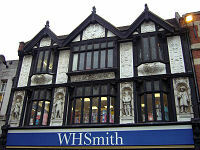 Turn to your left to see the famous facade above the W H Smith building, the very top panel of which depicts King Canute demonstrating his fallibility to his courtiers by proving that even a king cannot hold back the tide. Canute was responsible for founding the original Benedictine Abbey in the town during the 11th century, and it was also during his reign that the town - then known as Beodricsworth - was renamed St Edmund's Bury. Cross the square diagonally to arrive at Moyse's Hall. 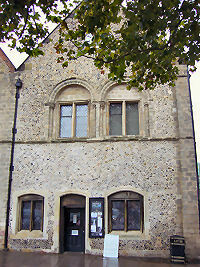 Built in around 1180 originally as a town house, Moyse's Hall has over the years served as a tavern, a workhouse, a police station and, since 1899, a museum. Alongside the local artifacts and archeology, the museum houses a Suffolk Regiment gallery, and an exhibition devoted to the infamous Red Barn Murder, including the death mask of the Victorian Murderer, William Corder. 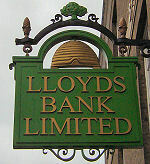 With your back to Moyse's Hall, skirt the edge of the square along Butter Market until you reach Lloyds Bank on your right hand side, with its unusual sign depicting an oak tree above a beehive. This serves as a reminder that it was once the Oakes Bevan & Co Bank. James Oakes, born in 1731, is still known today for the diaries he kept for almost 50 years. These gave a firsthand account of his life as a yarn merchant, banker, Alderman of the town, Justice of the Peace, Guildhall Feoffee and School Governor, during the turbulent period in history that included the American revolution and the Napoleonic wars with France. At the end of Butter Market, turn left and go down Abbeygate Street to reach Angel Hill at the bottom, you will find a lighthouse-shaped street sign commonly known as the "Pillar of Salt". 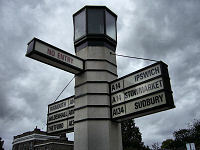 Built in 1935, and now a listed monument, it is thought to be the Country's first internally illuminated street sign. Straight ahead of you is the historic Abbey Gate, turn to your right and you will see The Athenaeum, originally built in the 18th century as Assembly Rooms, and which later played host to several readings from his works by Charles Dickens. Spin right again to find the distinctive facade of the Angel Hotel, where Dickens stayed in 1859, and again in 1861, in room 15, now known as the Charles Dickens suite. 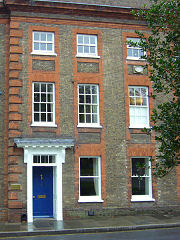 Dickens's connection with Bury dates back to the 1830s to his first novel, "The Pickwick Papers", in which he immortalises the town and specifically mentions the Angel Hotel. Turn to your right once more to find the Tourist Information Centre, where you can find local information, connect to the internet, or visit the gift shop. Come full circle, cross the road and turn left in front of the Abbey Gate. Follow this road round to the right into Munstow Street, and take the second road on the left, Cotton Lane, following the signs back to your starting point in the Ram Meadow car park. Copyright BuryStEdmunds.co.uk 2007-2009. All rights reserved.